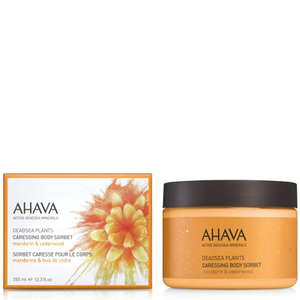 Reveal a radiant complexion with the AHAVA Facial Mud Exfoliator; a purifying formula that offers a deep cleanse whilst polishing skin. Suitable for all skin types including those with sensitive skin, the exfoliator sloughs away dead surface skin cells to thoroughly clean and even out the complexion. Harnessing Dead Sea Mud and an array of natural granules, the formula encourages healthy cell renewal and leaves the complexion touchably soft and ultra-smooth. Gently massage the facial mud on to a wet face. Rinse with water. Aqua (Mineral Spring Water), Sodium Trideceth Sulfate, Cellulose, Cetearyl Alcohol, Sodium Lauroamphoacetate, Caprylic/Capric Triglyceride, Calcium Carbonate, Propanediol (Corn derived Glycol), Silt (Dead Sea Mud), Cocamide MEA, Ethylhexyl Palmitate, Ethylhexyl Hydroxystearate, Glycol Stearate, Cetyl Alcohol, Silica, Glyceryl Stearate, Lactic Acid, Isopropyl Alcohol, PEG-100 Stearate, Hexylene Glycol, Ceteareth-20, Caprylyl Glycol, Chlorphenesin, Phenoxyethanol, Sodium Chloride, Disodium Lauroamphodiacetate, Hydroxypropylcellulose, Magnesium Aluminum Silicate, Hydroxyethylcellulose, Tocopherol (Vitamin E), Maris Sal (Dead Sea Salt), Panthenyl Triacetate.